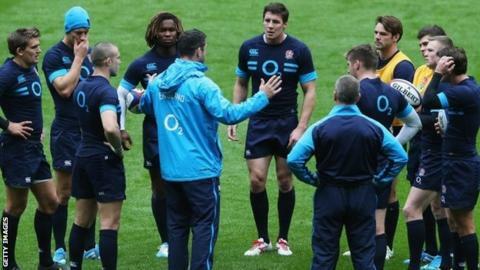 Backs coach Andy Farrell says England are a "champion team in the making" as they prepare to meet New Zealand. England delivered a shock win over All Blacks in 2012 and come into Saturday's match after wins over Australia and Argentina on successive weekends. "If you look at last year's New Zealand game, parts of the attacking game against Argentina were of a better standard," Farrell told BBC Sport. "We think there's a champion team in the making here as well." Farrell, whose eight England caps all came in 2007 following his switch from rugby league, admitted that England would be up against arguably at the weekend. "If anyone warrants that tag, they do," he added. "You wouldn't be asking the question in the first place if they didn't have the history to prove it. "They are a champion side that have been together for a long time. Those teams are not built overnight. "We are young in our development by comparison but it's something we'd like to emulate ourselves." Despite a dour second-half performance against Argentina last weekend, Farrell believes he saw enough in the first 40 minutes to suggest England can upset the world champions again. "Like any side, New Zealand have weaknesses," he added. "We are not a side that just wants to sit back and nullify the opposition, we want to take our game to them as well. "Against Argentina, we produced quick, fast ball that asks questions of any defence in the world. If we can do that for 80 minutes, we'll cause anyone problems." New Zealand have won 12 consecutive Tests since defeat in their 2012 meeting with England, clinching the Rugby Championship with a 38-27 win over South Africa before beating France 26-19 last time out. The BBC Sport app now has live streaming of BBC Radio 5 live as well as all the latest match reports, news and analysis. From 14:30 GMT on Saturday 5 live has commentary of England v New Zealand.